Our Secure App Service helps protect your business against major financial impacts and brand damage from mismanaged code signing. You get no-worry code signing visibility, agility, and trusted security. We safeguard your keys in our highly secure data centers. 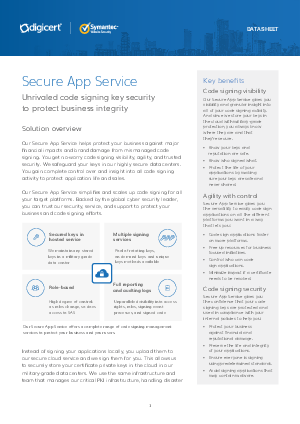 You gain complete control over and insight into all code signing activity to protect application life and sales. Our Secure App Service simplifies and scales up code signing for all your target platforms. Backed by the global cyber security leader, you can trust our security, service, and support to protect your business and code signing efforts.